I haven't done a "Currently" with Oh Boy Fourth Grade in awhile. It's so fun! Listening- I am currently listening to "The Bachelor". I say "listening" and not watching because it is actually my husband who is watching it. Yup. For real. I think I'd rather pluck my eyelashes out one at a time but he seems to get some enjoyment out of watching this train wreck. Loving- my son just began out of district placement. He is sooo happy and for the first time in a long, long time I have my happy go-lucky son back. All of the emails, meetings, phone calls, and every tear I shed over this has all been worth it. He still struggles with his dyslexia, dysgraphia, and dyscalculia but he is learning some very valuable strategies. Thinking- Am I ever going to get all this stuff done? I have 13 days of school left. All the assessments, the data recording, the slideshow, the report cards...Ok. I need to stop. I can feel the stress building. Needing- A fenced in yard. I love my beagle but I really hate walking him in the dark. In the pouring rain. In the cold, humidity. You name it. Hubby says we have to wait until next year's tax return. So it looks like Bentley and I will be struttin' our stuff through wind, snow, sleet, and hail so he can continue to sniff every leaf, plant, and shrub on Flintlock Rd. Summer- I cannot wait to go to Las Vegas again for the Teachers Pay Teachers Conference. I am sooo excited that my husband, Kriss who designs clipart on TpT is coming too! Kriss is an architect and he designed The Venetian back in the early 90's. To be able to go together is exciting and fun! I also can't wait to read a few books which I never have the chance to do during the school year. Our annual week long summer vacation on Cape Cod is something we always look forward to. Stop over to Farley's blog and link up to share your Currently! That is so cool that your husband designed the Venetian! It is beautiful. And I am so glad your son is doing well. I can't imagine what a relief that must be for you. Hope to meet you in Vegas! It would be great to meet you, Suzanne! My kids get out the 19th too-I have to go until the 25th! I hope you get your fence soon-but think of the exercise you're getting! Oh no! That's not fair. It should be the other way around so you can get some stuff done around the house before you are "on the go" non-stop. Almost....the end is in sight. Have a terrific summer! I can't wait for Vegas, either! This will be my 1st time at the conference. I am hoping to meet lots of bloggers that I follow and learn a ton. I hope I meet ya there! Karen, you will love it! The best part is meeting all the various bloggers. Make sure to save all those business cards you get. They come in really handy when you coordinate linkies, etc. I hope to meet you! Hi Julie! I'm so glad your son is happy in his new school and thriving! I feel ya with feeling the pressure to get everything in during these last few weeks… I keep swallowing down the anxiety as it rises. I look forward to meeting you in Vegas! I can't wait to meet you at the New England Blogger Meetup, Jillian. I'm a big fan of yours and follow your store. I had fun reading this post! So glad your son is happy! I feel bad for you that you have until June 19...but I bet you don't have to go back August 10 like I do! Can you post your husband's clipart link? I'd love to follow his store! Hi Aileen! Thanks so much! You are so sweet. My husband's clipart store on TPT is called KPClipart. Thanks for checking his store out! Congrats on getting your happy son back! I have a sometimes not so happy nephew that I would like back. It's great you and your husband will be attending the conference together. Will you be tag-teaming the sessions? So helpful! I'm so sorry to hear about your nephew. I truly hope he is able to get the help he needs and that he finds peace. I want a fenced in backyard too! I usually don't mind walking my baby but when she's taking forever to find a spot in the torrential downpours-yeah, not fun! Exactly, right? 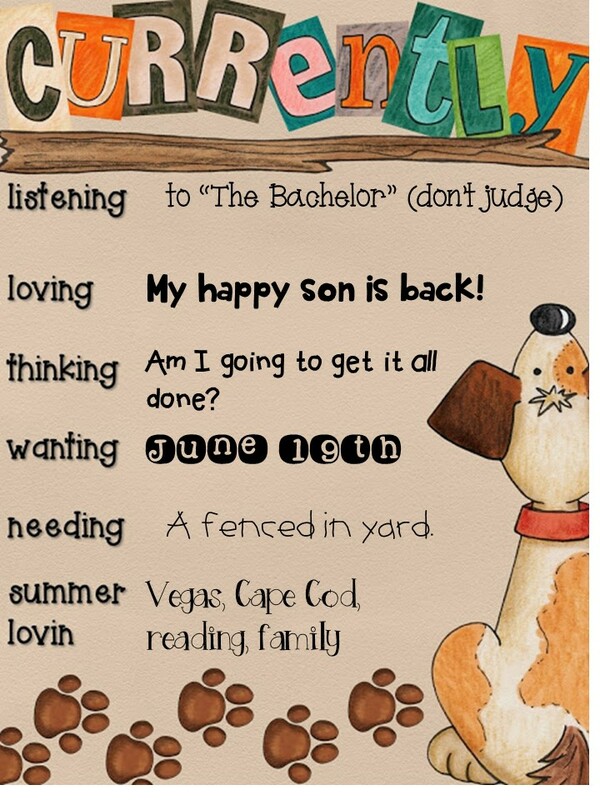 I have a beagle so he is verrry scent motivated and it takes forrrever! He sure is cute though! Dogs are awesome though! You too, Jessica! I hope you have a great summer!